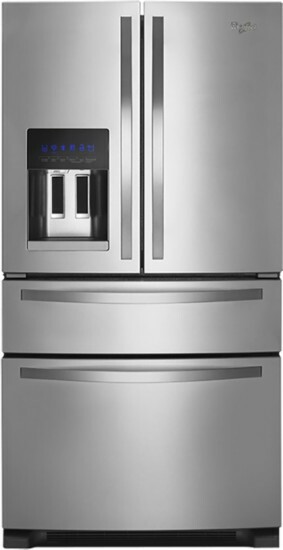 Whirlpool 25.0 Cu. Ft. French Door Refrigerator: With 4 shelves, an external refrigerated drawer and adjustable gallon-size door bins, this Whirlpool refrigerator makes it easy to organize your groceries, so you can keep plenty of food fresh. Easily access filtered water and ice for your beverages thanks to the thru-the-door ice and water dispenser and PUR water filtration system. Price is dependent on appliance Grade. Come in and see for yourself our various “Grade” Selection! List price may include C grade appliances.